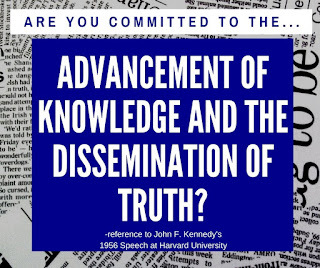 While creating my News Literacy LibGuide and lessons I stumbled up this quote from John F. Kennedy: "The goal of education is the advancement of knowledge and the dissemination of truth." Knowing not to take a quote off the Internet at face value, I researched the origins of the quote. What I found was a 60 year old speech that Senator John F. Kennedy gave at Harvard University. "I can think of nothing more reassuring for us all than to come again to this institution whose whole purpose is dedicated to the advancement of knowledge and the dissemination of truth." While I recommend you read the entire speech that then Senator Kennedy gave on June 14, 1956, this portion stood out to me, especially the parts I have bolded. "I belong to a profession where the emphasis is somewhat different. Our political parties, our politicians are interested, of necessity, in winning popular support - a majority; and only indirectly truth is the object of our controversy. From this polemic of contending factions, the general public is expected to make a discriminating judgment. As the problems have become more complex, as our role as a chief defender of Western civilization has become enlarged, the responsibility of the electorate as a court of last resort has become almost too great. The people desperately seek objectivity and a university such as this fulfills that function. And the political profession needs to have its temperature lowered in the cooling waters of the scholastic pool. We need both the technical judgment and the disinterested viewpoint of the scholar, to prevent us from becoming imprisoned by our own slogans. Therefore, it is regrettable that the gap between the intellectual and the politician seems to be growing. Instead of synthesis, clash and discord now characterize the relations between the two groups much of the time. Authors, scholars, and intellectuals can praise every aspect of American society but the political. My desk is flooded with books, articles, and pamphlets criticizing Congress. But, rarely if ever, have I seen any intellectual bestow praise on either the political profession or any political body for its accomplishments, its ability, or its integrity - much less for its intelligence. To many universities and scholars we reap nothing but censure, investigators and perpetrators of what has been called the swinish cult of anti-intellectualism." Kennedy's speech is relevant more than a half century later. 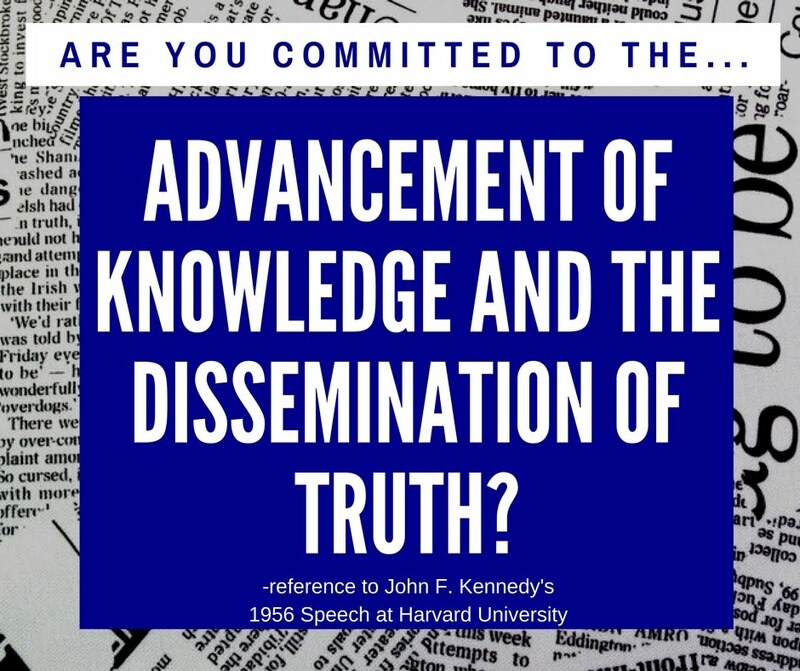 We are having the same conversations about the integrity and quality of information, about objectively and skeptically reading sources that claim to be factual, and about the importance of scholarly research skills to confirm authenticity. The 2016 election brought the epidemic of fake news to the forefront. While there has always a perversion of the truth in politics and news, never has it seemed more dangerous than in the times we are currently living. It is hard to disseminate what is fact or fake. Before the Internet, it was clear what magazines at the check-out counter were sensationalized. The Internet has blurred that line with very professional and believable websites. Today people seem apathetic to misinformation, and those people include our leaders. People see something on the Internet they want to believe and they read it at face value and then turn around and share it on social media, where it takes on a life of its own. I began working on lessons for students and creating a News Literacy LibGuide, collecting resources for students and teachers to use. KT Lowe, the Coordinator of Library Instruction and Service Learning at Indiana University East allowed me to use and build upon her Fake News LibGuide. I worked with Casey LaPlante, the Library Media Specialist at Granby Memorial High School in Connecticut to enhance what Ms. Lowe had created, providing resources for high school students. Laura Gardner, teacher-librarian at Dartmouth (MA) Middle School shared the presentation she is currently working on, allowing me to post on our News Literacy LibGuide. The links are below. I don't think there is anything left to be said about the ugliness and pervasiveness of disinformation and misinformation in our society. I, like many other librarians, have made it my mission to ensure students are equipped with the research skills needed read critically and skeptically and how to validate authenticity. Nothing should be taken at face value. Sources should always be verified. I want the teachers to have all the resources they need to help facilitate this learning as well. I want to the librarian who is remembered for being dedicated to the advancement of knowledge and the dissemination of truth. The following presentation is also available as a Pear Deck for a more interactive lesson. While it is still a work in progress I am willing to share it in the Pear Deck format if you contact me.